Screen Capture| Easily capture screens with Solid Capture. 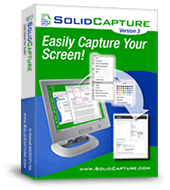 $29.95 Learn about Solid Capture features. Solid Capture gives you the power to capture everything from multiple full screens down to a single pixel of color. Capture multiple windows, drop-down menus, colors, and even text right from your screen. Editing, formatting, printing, saving, and e-mailing your captures are all a click away. You can even create your own PDF containing your selected captures. Solid Capture's simple design allows you to effortlessly capture your screen, sort and select previous captures, edit, print, and share with ease. "Keeping things simple is a beautiful thing: Solid Capture is so awesome, it's in daily use on my desktop!"